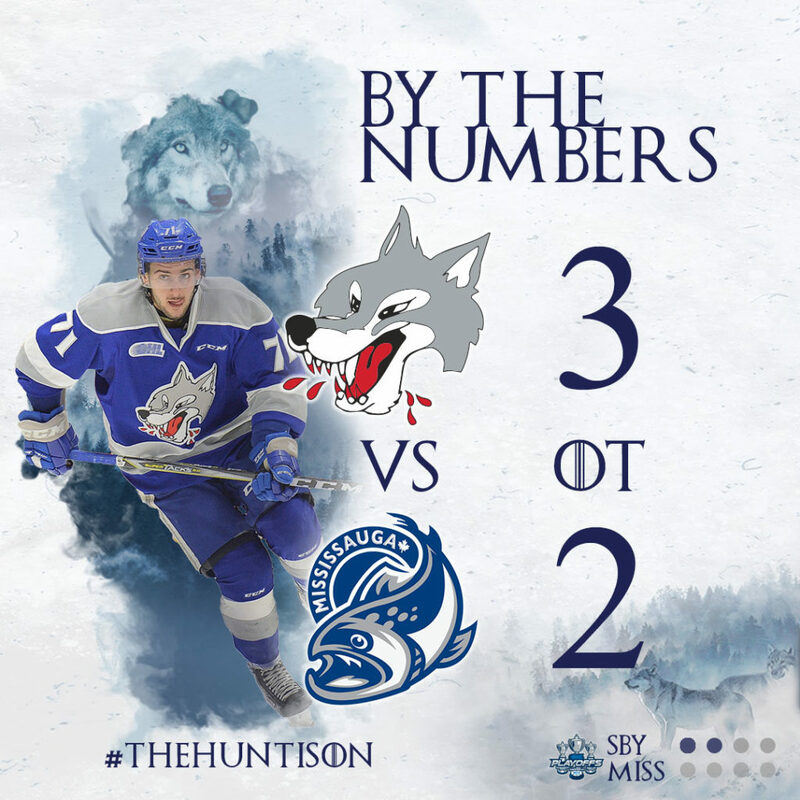 The Elgin Street barn was rocking on a Sudbury Saturday when they Wolves took on the Mississauga Steelheads in Game 2 of the playoffs. The Wolves had fans sitting on the edge of their seats as the game was pushed into overtime. David Levin slammed home the game winner to help secure a massive 3-2 victory with final shots on goal 41-29 in favour of Mississauga. Ukko-Pekka Luukkonen had an exceptional performance making 39 saves on 41 shots for the win. In the first period, James Hardie opened the scoring for the Steelheads to take an early 1-0 lead. David Levin then made it a tie game at one after he fired in a shot past Jacob Ingham off a pass from Adam Ruzicka. Ukko-Pekka Luukkonen made an unreal diving save which then turned to Quinton Byfield who rushed in on Mississauga and scored to give the Wolves the lead. After 20 minutes, the Wolves led 2-1. Moving into the second period, Nolan Hutcheson blocked the initial shot from the Steelheads, however former wolf Alan Lyszczarczyk turned around and beat Ukko-Pekka Luukkonen to bring things back to an even score at 2. In the third period, both squads battled hard to clinch the win but were unsuccessful, leading the game to be forced into overtime. In the extra frame, David Levin blew the crowd away as he took a pass from Adam Ruzicka and ripped in the game winner. The Wolves will hit the road Sunday morning and head to Mississauga where they will face the Steelheads for Game 3. To follow the Wolves on the road, fans can tune into the live play-by-play on CKLU 96.7 or stream it live on mixlr.com/sudburywolves.